Did you know, New Year’s resolution traditions date back 4,000 years? It’s all thanks to the Babylonians. 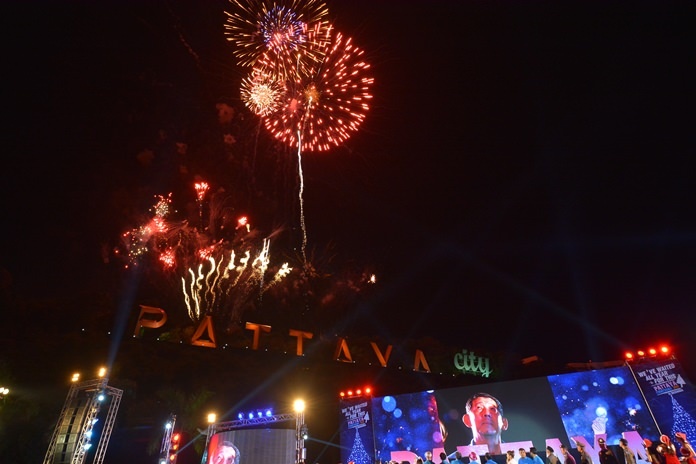 Meanwhile, Pattaya’s countdown into the New Year returned to recent tradition, with tens of thousands of revelers listening to popular bands and watching city sponsored fireworks at Bali Hai, as well as colorful pyrotechnics from hotels all up and down Pattaya Beach and beyond. 2017 might not have been the best year ever, but if the New Year’s Eve celebration is anything to go by, 2018 should be a banner year. 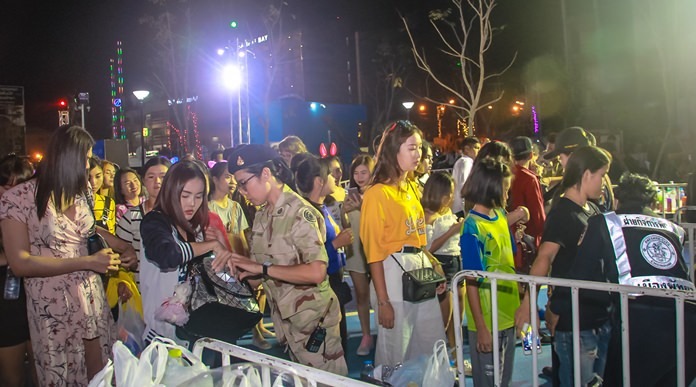 Pattaya’s headliner for the big New Year’s Countdown concert spent the night in jail, but the party went on without him as hundreds of thousands ushered in 2018 from Bali Hai Pier to Lan Po Public Park. 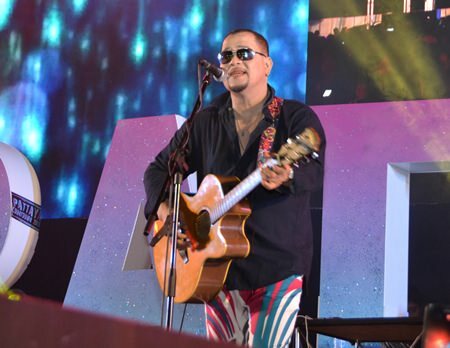 Seksan “Sek Loso” Sukpimai, former frontman of the 90s Thai rock band Loso, was captured by commandos Dec. 31 in his Bangkok home where he had barricaded himself to avoid arrest for firing a gun into the air at a Nakhon Si Thammarat temple three days earlier. 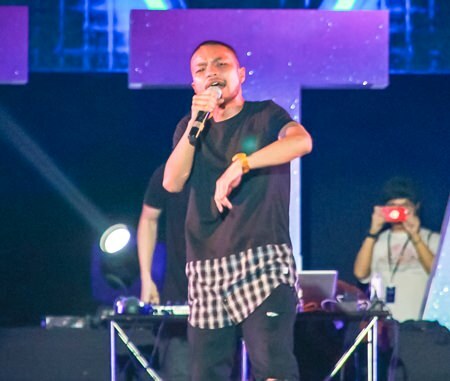 The arrest blasted a hole in the lineup of the revived Pattaya Countdown, with C-list acts, mellow pop artist Earth Patravee and Piyawat “Mickey” Piampai, trying to fill the Issan icon’s shoes. 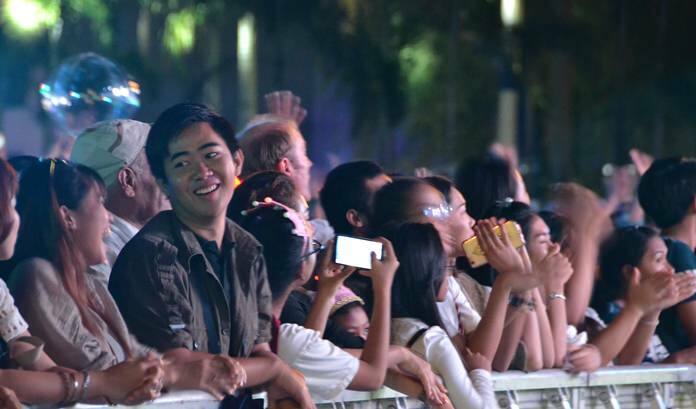 Mayor Anan Charoenchasri opened the Bali Hai concert, which carried the theme “We’ve Waited All Year for This”. 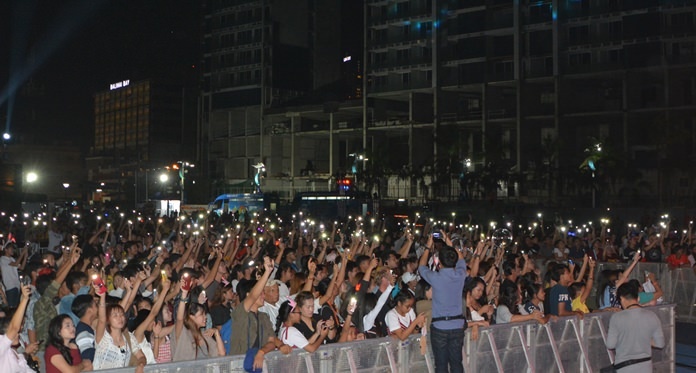 Clerics made New Year’s prayers for Christian, Sikh and Muslim followers before turning over the stage to warm-up acts EDM by Alphabeat @ Gateway, PiPo, Gavin and VKL. Anan and city officials returned ten minutes before midnight to count down the final seconds of 2017. Four minutes of fireworks capped the evening. 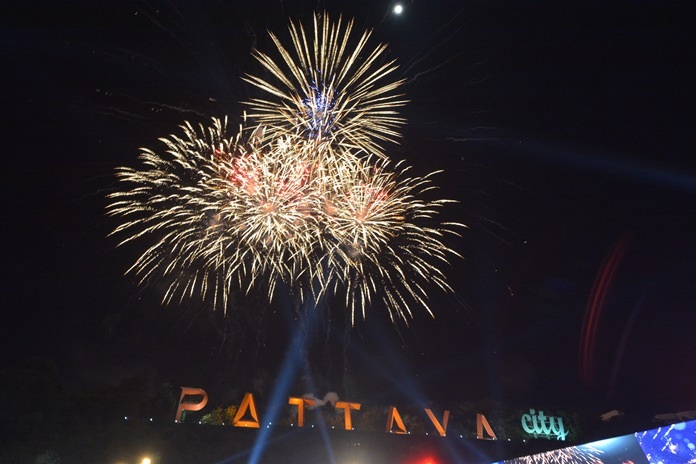 Fortunately, the New Year’s Eve party stretched far beyond the South Pattaya jetty, with revelers strolling shoulder-to-shoulder on Walking Street and driving bumper-to-bumper on every road leading in and out of the city. 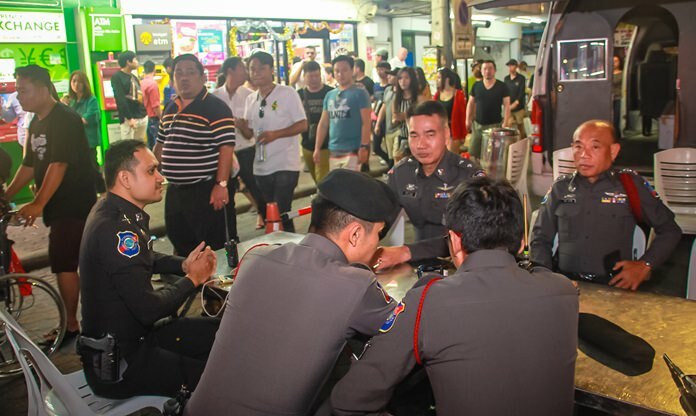 The only ones enjoying the gridlock were Pattaya’s infamously unregulated motorbike taxis, who gouged passengers for several times the normal fare without fear of local police. Things were quieter, but still lively, at Lan Po in Naklua, the site of last year’s official New Year’s commemoration. 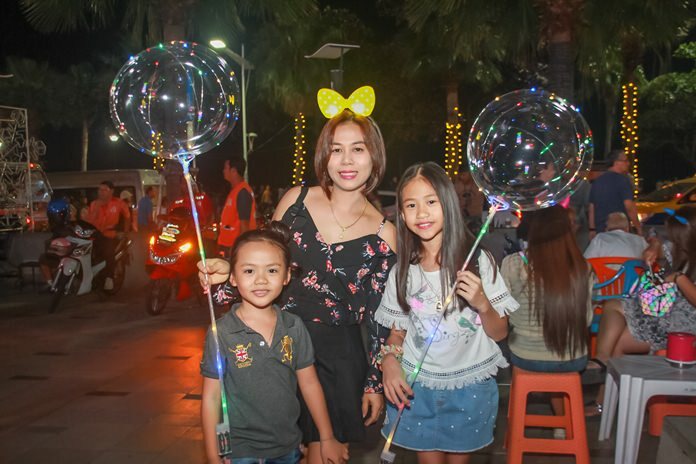 This year the atmosphere was more family oriented with groups of people of all ages laying down mattresses and enjoying the night with loved ones over meals of fresh seafood. Fireworks exploded across the area and all along the coastline at midnight. Yet hours later people were still carrying on. Many lingered in bars, restaurants and at the beach rather than dealing with the traffic. 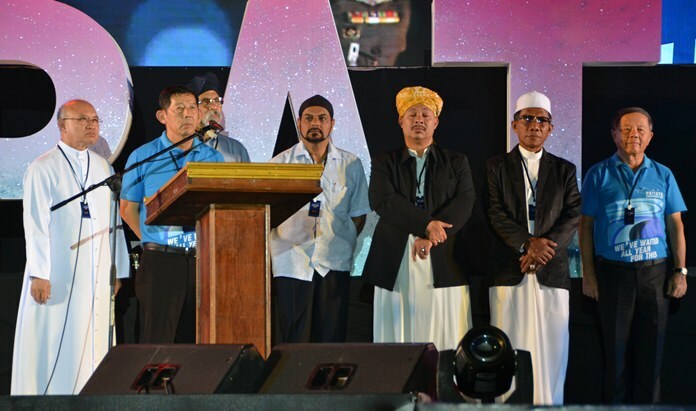 Clerics solemnly recite New Year’s prayers for Christian, Sikh and Muslim followers. It wasn’t all drink and song on this New Year’s Eve, however. 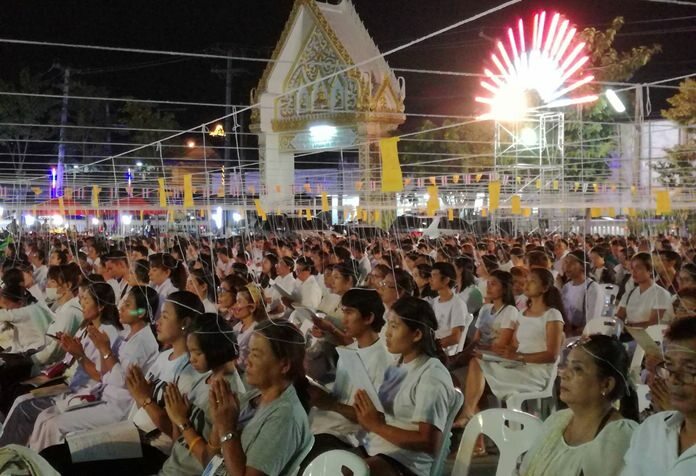 As is the custom every year, many spent the night praying and meditating in local temples at Sutthawat, Nong Yai and Chaimongkol temples. Many locals were seen dressed in white to show their purity and hope of following Buddhist dharma in the New Year. 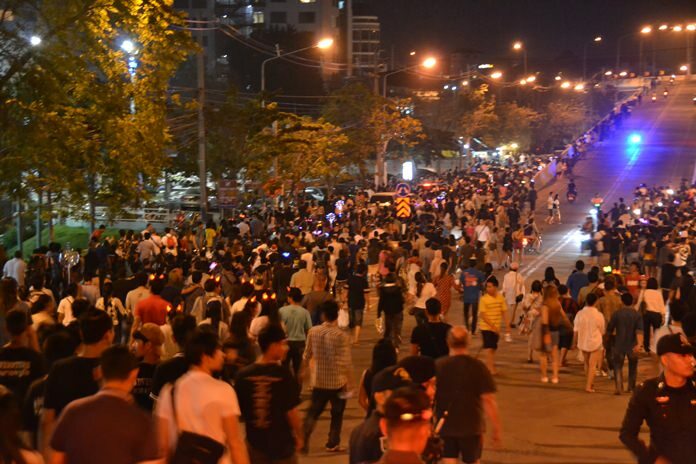 For those not hungover, 2018 started on a similarly devout note at 7 a.m., with monks receiving alms at Lan Po Park and during their procession to Central Road in an event organized by city hall. The F’off Band partly fills in for the missing headliner. 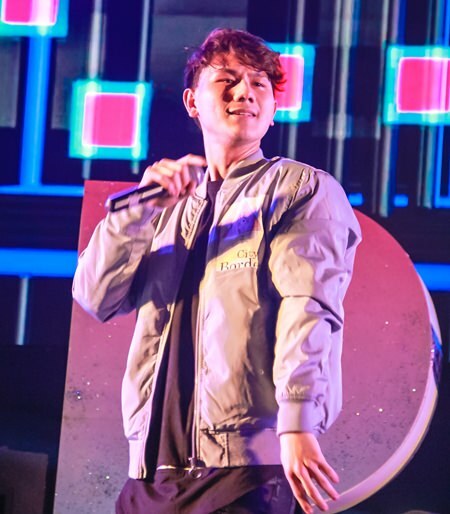 Earth Patravee is brought in to replace Sek Loso as the main attraction. Piyawat “Mickey” Piampai performs some of his well-known songs before the countdown. The Gavin Band keeps the night moving along. 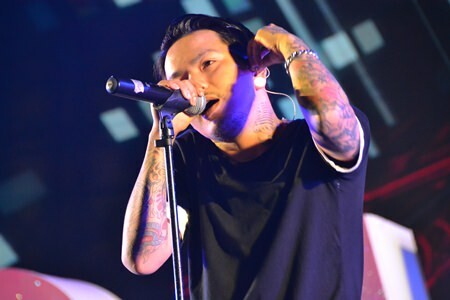 Rappers VKL shout their lyrics at the crowd. People pack into Wat Satawat to meditate, hoping to create good Karma. 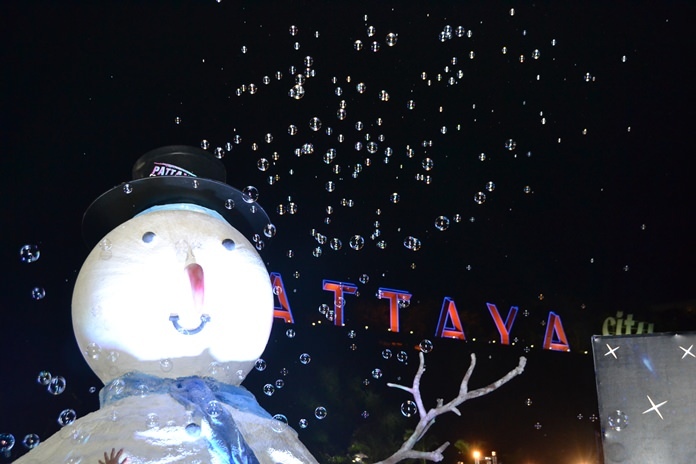 This snowman is enjoying his tiny bubbles, in the air. 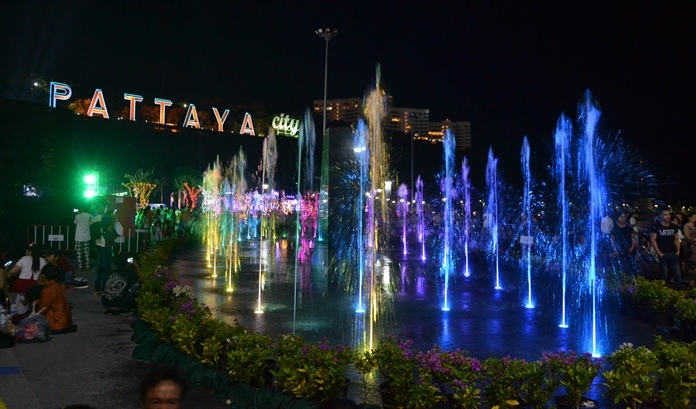 The new water fountain lights up the night. 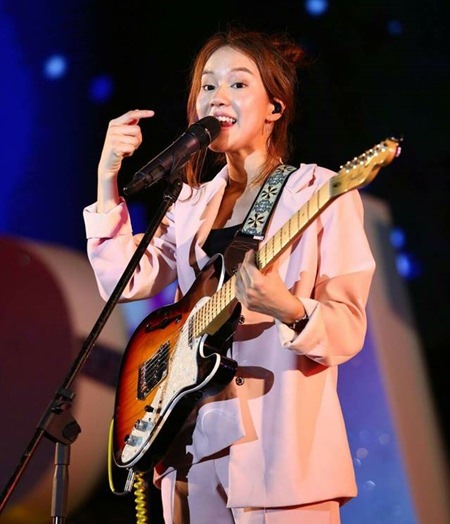 Although Sek Loso fans might have been a bit disappointed, the night carried on with other entertainers keeping the crowd alive. The Bali Hai streets and bridge area is packed leading up to the countdown. Tens, perhaps hundreds of thousands of people flock to Bali Hai to say goodbye to 2017 and hello to 2018. 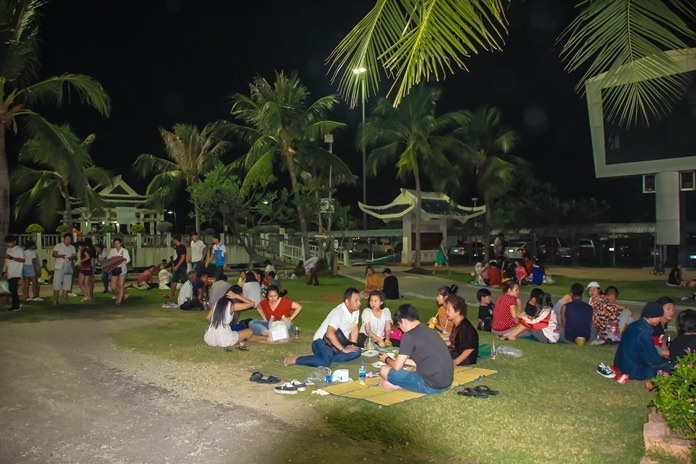 Lan Pho Park is a family orientated area, with people enjoying the atmosphere and tasty seafood. 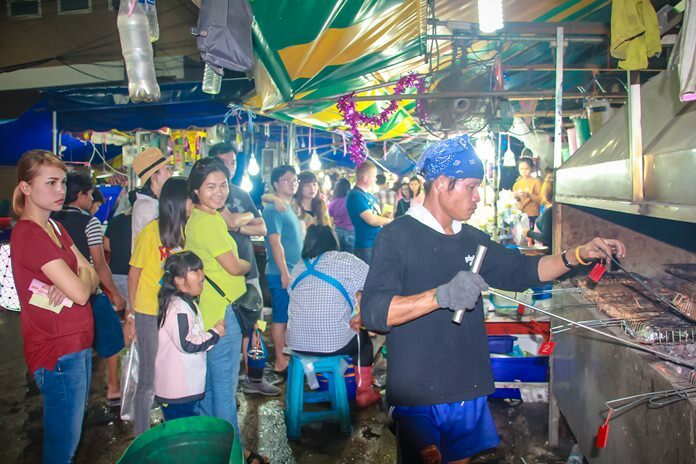 Local seafood vendors say their business is doing great, with three times the income of a normal day/night. 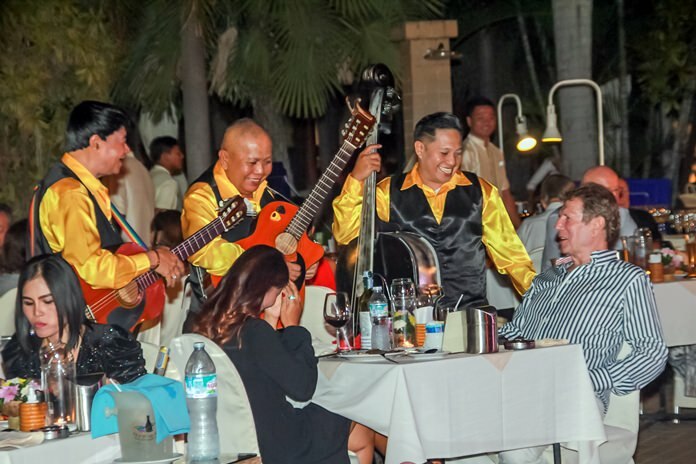 Apart from the public festivities, popular hotels like the Thai Garden Resort also enjoy private celebrations, along with great food, entertainment and more. 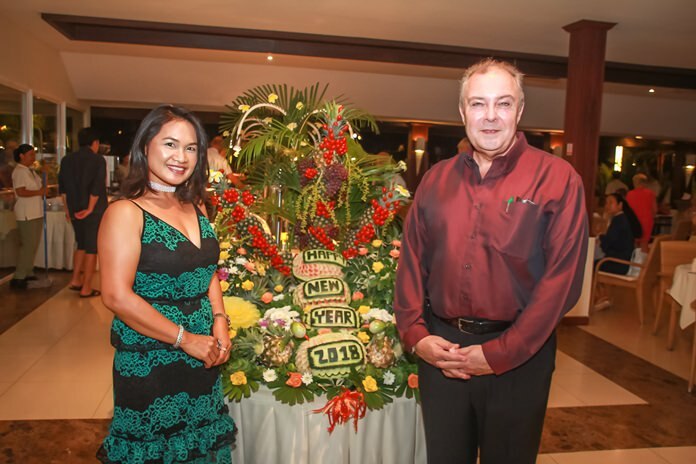 GM Rene Pisters and his charming wife Ploy welcome guests to the celebrations as the popular in-house trio treats diners to table side performances. A young mother takes her children out to welcome in the New Year. 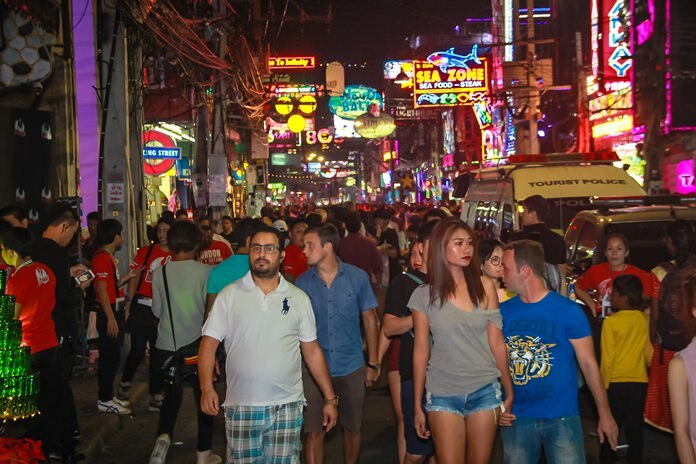 2018 begins with a jam packed Walking Street, with barely any space to walk. Police and volunteers remain at hand at all times to ensure safety around populated areas. No Sek Loso? No worries – these young Santarinas don’t seem to mind. Security is tight as all concert goers are scanned and searched for potential weapons and other illegal contraband. 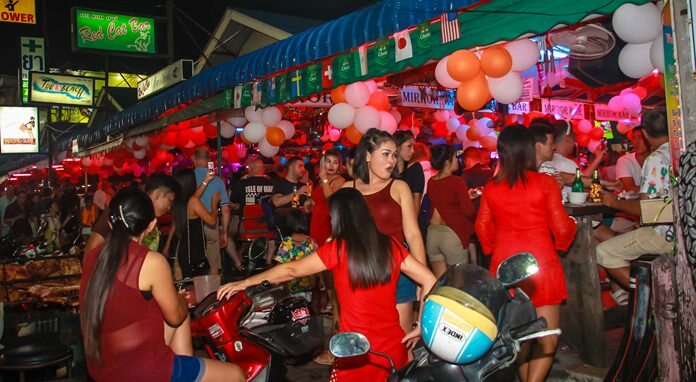 Bars and clubs were packed throughout the weekend in Fun City.